I’ve had this is mind as a short piece of fun since Alan posted this. I didn’t do much thinking about pick a place that is likely to have a lot of variety of subjects as my surroundings were quite monotonous(not in a bad way). When I was on a walk to Loch Humphrey and Duncolm yesterday I decided to try this out. I did think about which stretch of the walk would be good, but was stuck for some pictures, I didn’t see anyone else to get a picture of their feet or paws in that particular 20 minutes although it is a popular walk and I passed a dozen or so folk in the 3 or so hours I was walking. I failed to make a supernatural photo too. The exercise was good fun and would be an interesting one to do with a class of pupils. I will be repeating it myself. Perhaps using different sets of photo ideas. Here is my set: ds106photoblitz – a set on Flickr, I didn’t pict the best 5, just piled them in. To embed them here I decided to use Haiku Deck on my iPad. With the photos appeared in my photo stream as soon as I came home. I had hoped to search for and use the ones in flickr, but Haiku Deck didn’t find all of my pictures even after I gave them a unique tag. So I uploaded them from the iPad when I saved the Deck. When I read Alan’s post I copied the photo idea to my dropbox so I could find them whenever I decided to give the challenge a go. This had me thinking a bit. I though I could make a webpage that would supply a random set of photo ideas. I took Alan’s list, mixed in some from the, now discontinued, Daily Shoot site, and made a webpage that shows a random set of 7. photoblitzer. I spent a wee bit of time shorting the challenges so that 7 would fit on an iPhone screen (iPhone 4). The page also show the current time to act as a start clock picture which will give the list of challenges. It might even be useful. 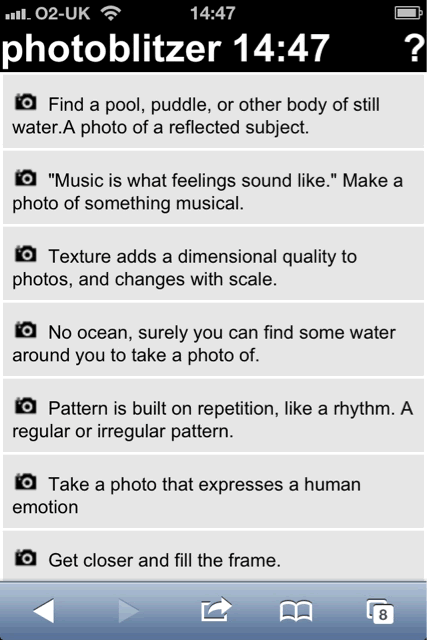 Update: photoblitzer is now updated with >160 photo tasks to draw from thanks to Alan Levine sending the whole of the DS106 Daily create photography section. I’ve also added a button to let you copy the html for the list as I though that might be useful for sharing a random set of tasks. Update 9 Oct: I just added a toggle to the colours of the items listed, you can use the webpage, on your phone, to keep track of the pictures you take. NB don’t refresh the page. This is such a great idea, and I plan to make a recommendation to use it in the future. If you wish, I can extract all of the photo daily creates if you want to add to the deck. I’d appreciate a dump of the Photography category from tdc thanks.